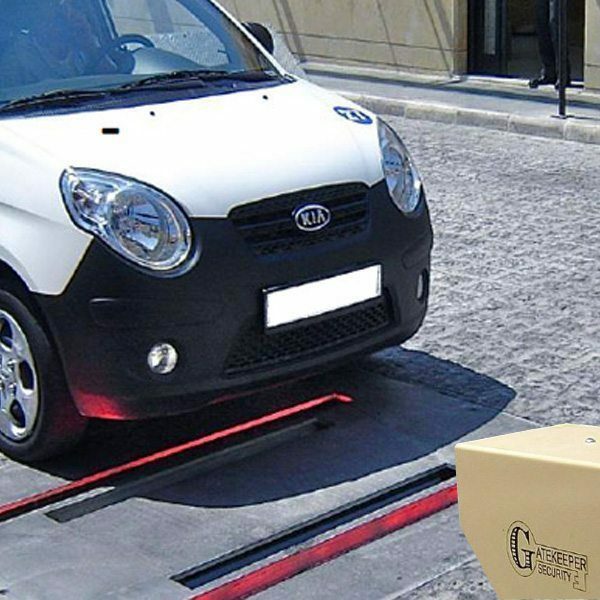 Gatekeeper GKR-2011 Embedded Under Vehicle Inspection System | US Testing Equipment, Ltd. 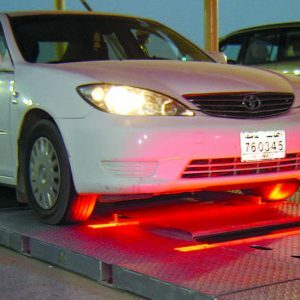 CORE TECHNOLOGY: Gatekeeper’s under vehicle inspection technology uses Area Scan Image Processing technology that allows vehicle images to be normalized, regardless of the speed of the vehicle, as it crosses the scanning platform. 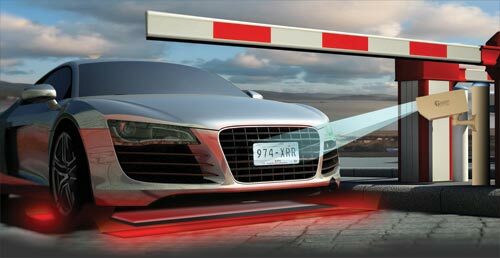 Other under vehicle inspection technologies such as recorded video streams, or line scanning systems aren’t capable of either automatic vehicle identification or change detection. The reasons for the failure of these technologies is twofold; one, generally very poor image quality and two, they require the human operator to view and compare the images and decide if there is any object or modifications that could pose a threat. Live/recorded video and line scanning systems have been proven consistently to be unreliable as an inspection technology due to these factors and their total reliance on human knowledge, attention span and intervention. Two Views of the Vehicle Under Carriage (virtual 3D images): Gatekeeper’s 1011 and 2011 systems compile two high resolution digital images of a vehicle under carriage and creates a virtual “fingerprint” of the vehicle. Two independent views are necessary to provide the maximum amount of visual information to permit automatic identification and automatic searching. The two views or virtual 3D image makes it more difficult to hide objects, explosives, etc. on top of an axle or cross beam under a vehicle. Automatic Vehicle Identification: Gatekeeper’s system uses the vehicle fingerprint to automatically identify the vehicle by matching the image against a database of vehicle fingerprints. The system does not rely on license plates, etc. to recall the vehicle from the database. The vehicle is recalled via Gatekeeper’s patented pattern recognition algorithms. The two images are converted into a digital computer file and stored in a SQL database where they can be matched against the entire database. When a match is found the identity of the vehicle make and model can be (user defined) displayed on the operator terminal. 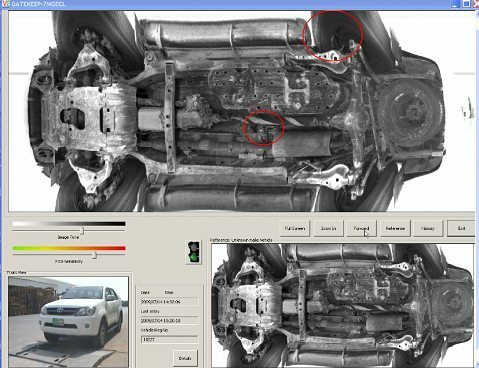 Automatic Foreign Object Detection: Gatekeeper’s system is the only system that can automatically compare a newly scanned vehicle to a prescreened vehicle (Reference Image) and immediately identify any foreign objects or modifications to the undercarriage. When a difference or change between the Reference Image and new scanned image is identified by the system it automatically places a red ring around the difference i.e. explosive or change to undercarriage, etc. and activates an audio and/or visual alarm to alert the operator of the threat. Networking and Integration: The system can be integrated with weigh-in-motion scales, biometric systems (fingerprint, etc. 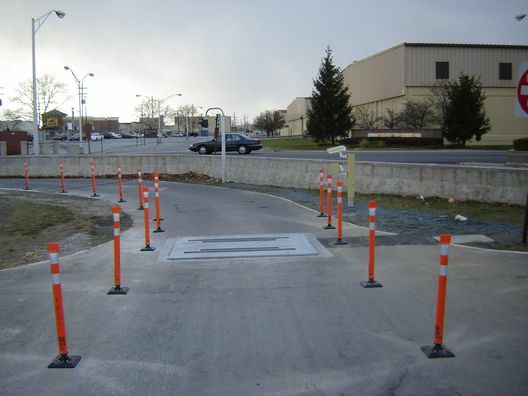 ), facial recognition, license plate reader, RFID identifier, Smart card reader, barriers (road blockers, Cats claw, bollards or similar) and many other entry control point technologies. Gatekeeper systems are network enabled that allow any number of monitors to either observe or operate any scanners on the same network.